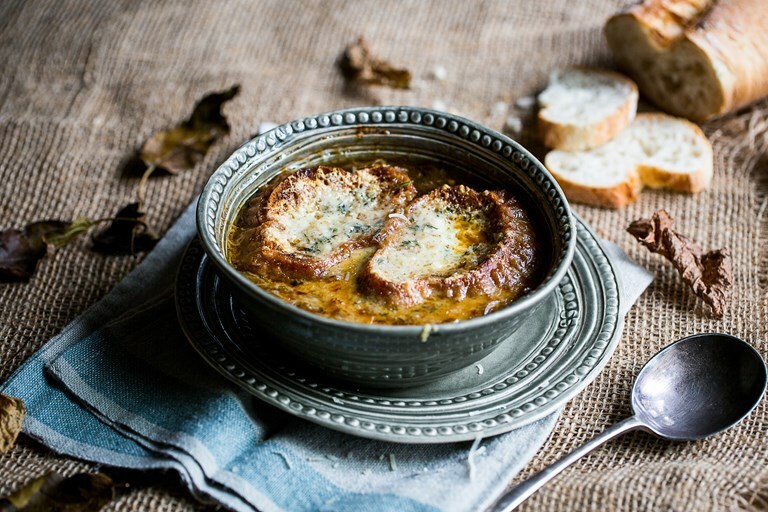 This stunning French onion soup recipe is pure comfort in a bowl. As Louise explains, the key to perfecting this dish lies in having a little patience – take your time and witness the beauty of the humble onion being transformed into an exquisite dish. French onion soup is a classic dish, loved for the simplicity of its ingredients - onions, stock, wine, a few herbs. But in order to create the perfect French onion soup recipe, there is another essential ingredient – patience. It takes time to create this dish. Time for the onions to slowly mellow, to gently caramelise without burning, otherwise they will add a bitter note to the soup. It cannot be rushed. The onions are usually gently cooked on the hob until soft and caramelised, but I find it is easier to cook them slowly in a covered roasting tray in the oven, as they are less likely to burn. A kilo does seem like a lot of onions, but they will reduce significantly when cooked, so do not be tempted to reduce the amount. 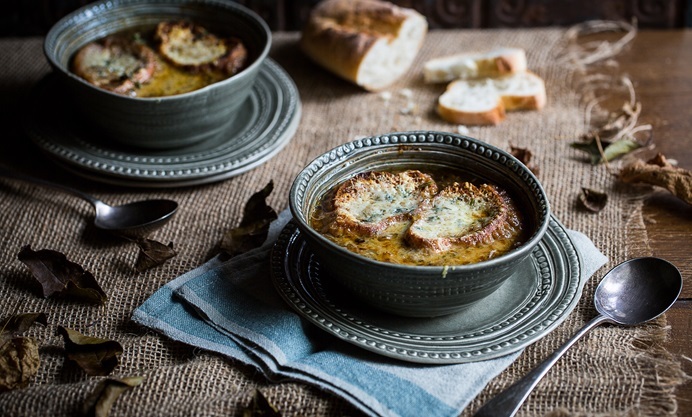 The best French onion soup is made by creating layers of flavour, starting with a good quality beef stock, then adding caramelised onions and wine. My version uses Essential Cuisine’s Veal Jus, which adds a luxuriously rich flavour boost to the finished soup. Served with melting Gruyere toasts, this is the ultimate winter comfort dish.